Sticky Carrot Squares #SundaySupper | What Smells So Good? Preheat the oven to 350F and line a 9” square pan with a “sling” of greased foil. In a bowl, whisk together flaxseed, water, apple butter, almond milk, oil, xylitol, stevia, salt and spices until thoroughly combined. Add the flour, guar gum, baking powder and baking soda. Stir to combine well. 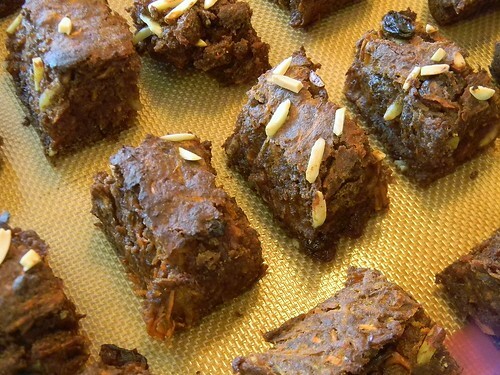 Fold in carrots, raisins and measured almonds. Scrape into the pan and smooth the top. Sprinkle with additional almonds. Cover pan tightly with foil and return to the oven for 15 minutes. Remove bars from the pan (use the “sling”) and cut into 16 pieces - these will still be gooey. Place pieces on a parchment or silicone lined baking sheet and bake 30 minutes. Cool on the sheet, then store in an airtight container in the fridge up to 5 days.